The earliest records show that J.P. and Lovina Langdell owned the home in 1884. Soon after, C.H. 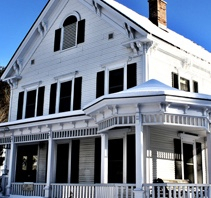 Stearns, the Vermont Lieutenant Governor from 1904-1906, purchased the home. In 1983, the home was purchased and renovated by Lamoille County Mental Health Services. The Johnson Group Home is a 7-bed facility that works with individuals to teach them life and daily living skills. The purpose is to help prepare them to live independently in the community. The Group Home is part of a larger treatment team that helps individuals learn how to manage their mental health symptoms, learn skills to help them find appropriate housing, employment, and positive community supports. The group home serves as a base for residents to develop the necessary foundation for further recovery. Residents are supported in efforts to strengthen life skills and prepare for successful independent living. Residents meet eligibility criteria for HUD funding and have clear goals to achieve during stay in the facility. Residents agree to work on Individual Plan of Care (IPC) and any areas deemed necessary for successful transition. Generally, the residents are expected to work on goals, making noticeable progress, and have a stay of 6 to 18 months, but the stay is based on individual needs and progress. Residents will abide by Therapeutic Community Residence regulations also set forth by DAIL/Licensing and Protection.